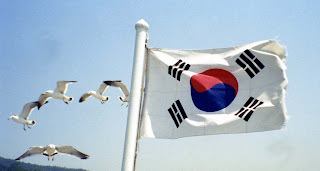 The Taegukgi flag in its current form was first seen in 1883. Taking the traditional symbol, the Taegeuk. 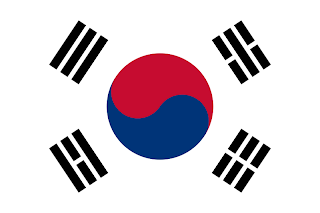 It represents the yin and yan of all things in the universe, the negative and the positive.The oldest known flag which was in use during the occupation of Korea by Japan, has the taegeuk spiralling far more than the current flag. Surround the taegeuk are 4 trigrams. The trigrams have many meanings. Nature, the season, the cardinal directions, 1 of 4 virtues, the family, the four elements, and meanings. In the lower hoist, "Ri." This represents the sun, autumn, south, courtesy, the son, fire, and wisdom. In the upper fly, "Gam." This represents the moon, winter, north, intelligence, the daughter, water, and vitality. In the lower fly, "Gon." This represents earth, summer, the west, righteousness, the mother, earth, and fertility. After WWII, both the North and the South flew variations of this flag, until the North adopted a flag more closely linked with its Soviet cousin's flag. 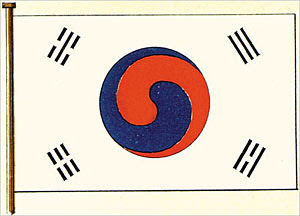 On the South Korean flag, the red represents the positive in the universe, the blue represents the negative. The white represents the purity and cleanliness of the Korean people.